Anne Blythe has a great life: a good job, good friends, and a potential book deal for her first novel. When it comes to finding someone to share it with, however, she just can't seem to get it right. After yet another relationship ends, Anne comes across a business card for what she thinks is a dating service, and she pockets it just in case. When her best friend, Sarah, announces she's engaged, Anne can't help feeling envious. On an impulse, she decides to give the service a try because maybe she could use a little assistance in finding the right man. But Anne soon discovers the company isn't a dating service; it's an exclusive, and pricey, arranged marriage service. She initially rejects the idea, but the more she thinks about it -- and the company's success rate -- the more it appeals to her. After all, arranged marriages are the norm for millions of women around the world, so why wouldn't it work for her? A few months later, Anne is travelling to a Mexican resort, where in one short weekend she will meet and marry Jack. And against all odds, it seems to be working out -- until Anne learns that Jack, and the company that arranged their marriage, are not what they seem at all. 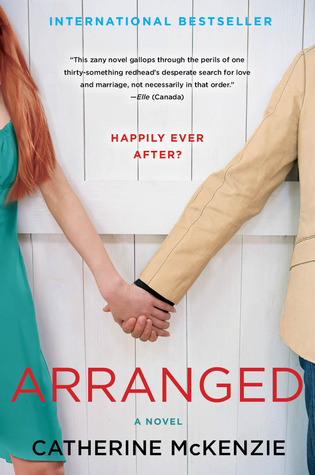 I bought myself a copy of Arranged after reading Jen from Pop! Goes the Reader's review, which made it sound like a fun and fast-paced read. I've been in a weird mood this year where I haven't wanted to read very much, so the things I've gravitated towards have been quicker and lighter books. I don't want anything "fluffy," but I've been desperately in need stuff that's very entertaining. Spending a few hours reading Arranged was just what I needed! While it's not necessarily a life-changing read, it was perfect for my mood. Anne is an interesting heroine. I'll admit that I struggled with her at times - mostly because she's intelligent enough to recognize her weakness for handsome (but horrible) men but still continues to fall into the same patterns in her relationships. It made her seem a little immature and shallow, which made it hard for me to connect to her. However, that didn't really detract from my enjoyment of the book. You don't have to love the heroine to find the premise intriguing! And I started to get to know her more, I was able to understand her a little better. I was happy to see her opening herself up to a new experience, even if it was one that was totally unexpected. I really liked the exploration of arranged marriages since it's not something I read (or hear) about often. I'm always interested in "marriage of convenience" stories, but I usually find it in historical fiction. I rarely get to read a contemporary take on this topic! I could identify with Anne's skepticism of arranged marriages, and I found myself coming around to the idea as she did. There were moments I thought - I can see how this could work - which I'm not sure I would have said before reading this book. There's something to be said for the idea that friendship might matter more than "falling in love." I say might because you'll need to read this book for yourself to find out exactly what happens. But I definitely loved the emphasis on being partnered with someone who gets you and just generally enjoys spending time talking to and hanging out with you! I expected Arranged to be a bit predictable, but it really wasn't. I mean, in a way, you do have a good idea about what's going to happen. But, at the same time, I found myself surprised by certain developments and twists. The book is divided into three parts, and you don't even meet Anne's potential husband until Part Two. I liked the focus on Anne's mindset, her desires, and the things that lead up to her decision about her future! But I'll admit that Part Three was my favorite - mostly because I loved seeing the repercussions of her decision. There are a number of nods to Anne of Green Gables in this book, which was such a fun bonus. Anne's mother was obsessed with the series, so she named her children Gilbert and Anne. But the references don't stop there, and I loved this aspect of the story. If you don't know already, I'm a huge L.M. Montgomery fan. It's probably my favorite part of the book, and the thing I'll remember most about it. All in all, Arranged was an enjoyable read! I'll be keeping my copy - the memory of it will make me smile whenever I spot it on my shelves. I don't know that I'll re-read it anytime soon, but I'm so thankful I had it on hand during my current mood. It managed to be light while still being thoughtful - giving a story that could have felt cliché a surprising resonance. This was my first book by Catherine McKenzie, but it won't be my last! Arranged sounds like a fun read to me! I'm definitely a fan of reading lighter contemporary fiction, particularly when the mood strikes me. And now, when the weather is getting warmer and I'm feeling a bit more relaxed about my reading, Arranged sounds like the kind of book that I'd love to curl up on the couch with! I'm excited about the Anne of Green Gable nods AND I'm curious about the arranged marriage portion of the plot. Can't wait to give this one a shot! Yes! I really enjoyed this one. :) This was my second book of Catherine's and it really made me into a fan of her writing! If you haven't read Spin yet, I'd totally recommend that one, too. This may not sound like a book I'd be dying to read, except that I think the Anne of Green Gables references are adorable! That alone makes me think I'd enjoy this one.